Whether you are sharing a beer with your mates or cocktails with the ladies, alcohol has truly become one of the defining features of the human experience. Today we are faced with a plethora of choice from craft beers to exotic spirits. With so much variety we should feel empowered, but more often than not we see it as an obstacle, ultimately choosing to fall back on our old favourites. In the past decade another competitor has been thrown into the ring, and if you’re reading my blog you’ll know that I’m referring to wine. With reds, whites, rosés, sparkling, dessert, and fortified styles on offer from all around the world, there is now even more diversity. By being aware of a few key points, you will find that wine actually offers a lot of value. i) This article is written in the context of being on a second or third date. Wine is more conducive to creating a casual social experience and building rapport. What you should NOT do is post up at a bar, buy a $100-bottle California Cabernet and expect the ladies to pile onto you. Anyone who tells you to do so is trying to sell you something. ii) This article is not arguing that wine is somehow better than spirits or beers. I’m partial to craft beers and the occasional Old-Fashioned myself. There’s a time, place and occasion for everything. Wine has benefited from a great marketing campaign for the past few decades, and there’s no denying that its public image is tied to the finer things in life. Imagine you are in a bar or lounge. You spot a man having drinks with a woman. If they’re drinking beers, they’re probably just friends hanging out. If they’re drinking cocktails, the guy wants to get laid and the girl might just be fishing for drinks. Don’t be a snob. Relax, be social and act with grace. As I’ve intimated before I do enjoy the occasional cocktail. If you’re anything like me, you’re not just going to order one Old Fashioned and call it a night. You’ll be ordering a Mojito next, followed by a Margarita, then a Daiquiri for dessert. Things start add up if you are buying drinks for your date as well. After doing some research it seems the average cost of a cocktail is around $10. At more upscale places this could quickly rise to $15-$20. For a typical night out, you’re looking at spending $40-$80 at the very least. In contrast, most venues will have wines available for around $10-$15 by-the-glass. But the secret to getting value lies in buying bottles. The full-bottle price of these offerings are usually three to four times the glass price, yet you can get up to five pours from one bottle. In effect, ordering a bottle is like taking advantage of a promotion—buy four glasses, get one free. So if you’re committed to spending $40-$80 anyway, a bottle of wine (or two) will take you a long way. Don’t be sidetracked by the more expensive offerings on the list, as price is no guarantee of quality. The line to the bar is three people deep. You’re there for what feels like an hour. By the time you’ve gotten your two Vodka Martinis you turn around and begin to walk back… only to see your date being chatted up by some 6’3” suited-up gentleman. And from the way you see her giggling at his every word, she’s enjoying it. And what are you doing? Standing there holding onto two Vodka Martinis like an alcoholic, that’s what. Sure, maybe you’re Don Draper you can go up and tell the guy not-so-politely to leave, but the love bubble you had built has popped, and the atmosphere has changed. A bottle of wine solves this problem simply. Her glass is empty? Smoothly pick up the bottle and pour her another measure. I’ve mentioned before that you can typically get up to five pours from one bottle. What if I told you that it could be stretched to 8-10 glasses? All you have to do is pour less each time. 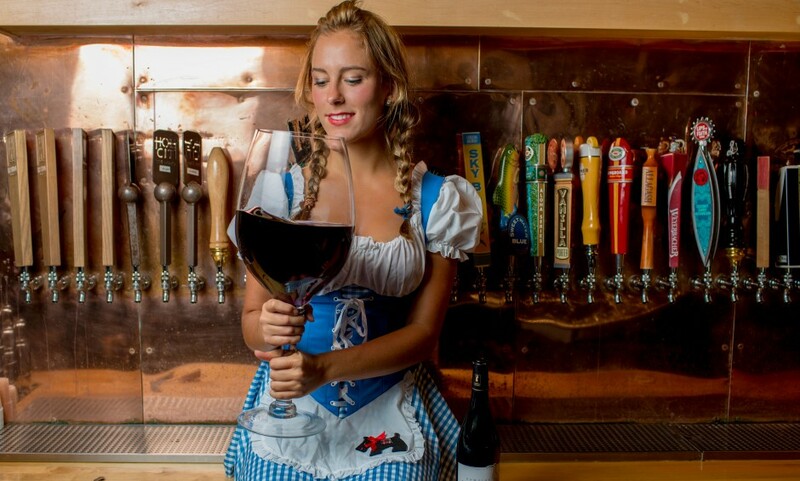 I like to use two or three fingers to measure the height of the liquid in the glass. With practice, you don’t even need the fingers to measure, free pouring perfectly each time. If anyone (like your date) asks why you are drinking so slowly, tell them you just like to take your time to appreciate the wine. Less liquid in the glass means you can swirl more vigorously, releasing more aromas. And why is everyone in a rush to drink? Why not slow down and have a good time? Smile confidently as you say this. Make a game out of it. Teach her how to engage the senses. What colours do you see? What do you smell? What do you taste? What is the texture like on the palate? Most wines hover around 10%-15% alcohol by volume. Compare this to most spirits which regularly go over the 40% mark. If you’re on a date, you don’t want to impair your judgement just because you’ve had one drink too many. After a few shots of tequila, your judgement might be off. Have you built up enough rapport? Was that her licking her lips or just a nervous tic? Is now the right time to go for the kiss? Just one badly calibrated move can result in you scaring away your date. With wine, you are free to moderate your intake by pouring less (Tip #4, above), basking in that comfortable zone between mundane sobriety and total inebriation. Have a conversation. Flirt a little. Sit back, relax, and smell the rosés. While this article is framed around the scenario of you being on a third date with an attractive young lady, you will find it just as applicable if you’re having a business lunch with an important client or a good time with friends. Your only problem now is finding a wine that you will actually enjoy. My e-book, The 7 Key Wine Concepts, is the perfect guide for anyone who is just getting started with wine and wondering where to start exploring. If you want to skip that exploration altogether, check out my Personal Wine Consultation service, where I offer personalised wine profiles delivered within 24 hours, guaranteed, in addition to my e-book as a free bonus.